South African firm SAOTA has completed its first project in Los Angeles, which involved converting a 1970s Spanish-style residence into a more minimal dwelling. The Stradella house is situated on a promontory in Bel Air, an affluent LA neighbourhood in the foothills of the Santa Monica Mountains. 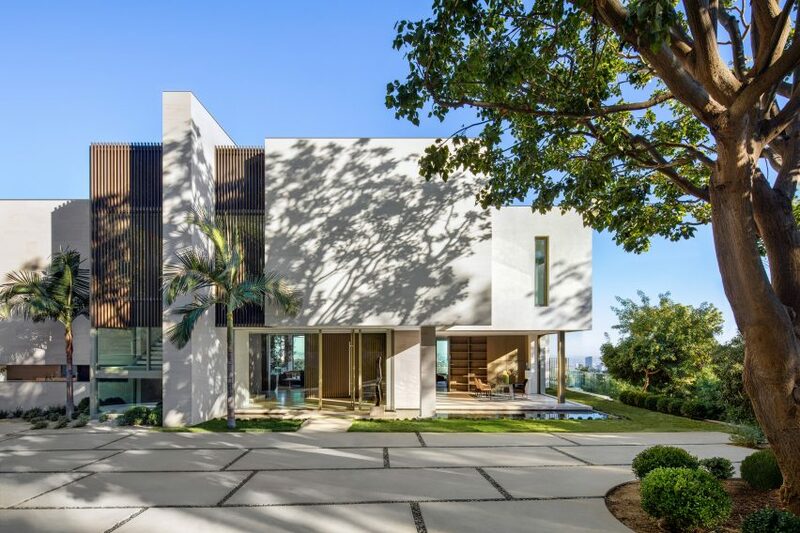 Wrapped in stone, stucco and glass, the residence is afforded panoramic views of the city, from Downtown LA to Century City and the Pacific Ocean. Encompassing 12,700 square feet (1,180 square metres), the project involved the renovation and expansion of a residence completed in the Spanish colonial revival style in the 1970s. SAOTA, a Cape Town-based firm, was tasked with enlarging and opening up the home, in addition to giving it a more contemporary look. The client specifically requested that the studio “expunge all traces of the original Spanish-style architecture”. “SAOTA decided to strip the existing house back to its timber skeleton, maximise the square footage and, by reinforcing or extending where necessary, create generous openings to draw the beautiful West Coast light, the rolling vistas and the verdant setting deep into the floor plan,” the firm said in a project description. The design team retained the site’s original layout, which ensures privacy from the street and orients spaces towards the views. A curved driveway cut into a wooded hillside leads to the home’s entrance on the west side, which is marked by a leafy forecourt. For the entry elevation, the team conceived a “sculptural composition”, featuring an interplay of solid and void. The north end is meant to read as a “massive buttress” that ties to home into the hillside. In contrast, the opposing end consists of boxes that balance atop pilotis. The central portion features a tall, intersecting plane and vertical louvres, which shade a glazed stairwell. “There is a deliberate transition as the weighty forms of the entrance, anchored into the hillside, give way to a lighter structure hanging vertiginously over it, aligning to the city grid and framing the views,” the team said. Inside, the team reconfigured the floor plan in order to provide opportunities for indoor-outdoor living. Where possible, solid walls were replaced with full-height glazing. In many rooms, retractable glass doors offer a direct connection to outdoor terraces. The home’s openness takes cues from the famed Case Study Houses – experimental, modernist homes that were produced from 1945 to 1966 and designed by noted architects such as Richard Neutra and Pierre Koenig. Many of the dwellings were shot by photographer Julius Shulman at the time. 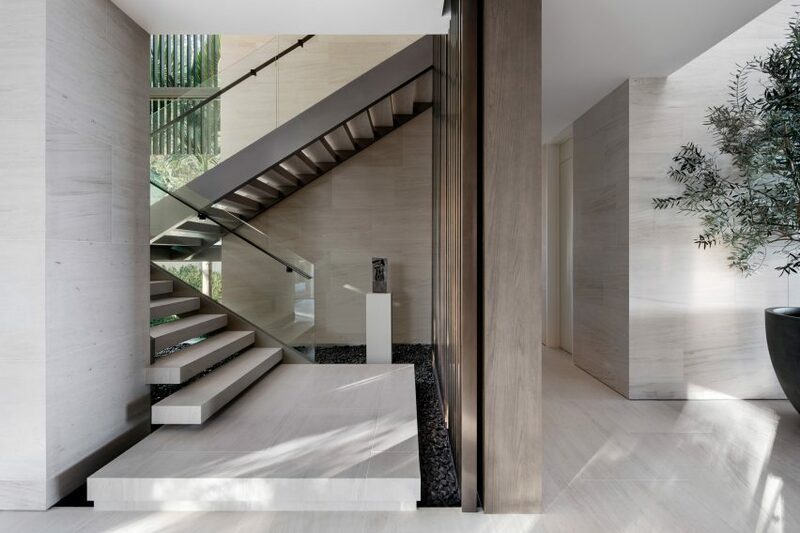 “This nod to the utopian Californian modernism of the Case Study Houses is reflected in the porous nature of the reconfigured floor plan, which aims to capture the essence of Californian living, with internal spaces feeling light, fresh and open – connecting the various functions of the house for modern family living and grand entertaining alike,” the design team said. The ground level contains public areas, while the upper level encompasses several bedrooms, including a spacious master suite with a pair of dressing areas. The basement contains a gym, spa and wine cellar, along with areas for staff. A new wing to the north houses a theatre and games lounge, and defines a new motor court at the basement level. One of the home’s most prominent features is a 131-foot-long (40-metre) white canopy in the rear that shelters a terrace overlooking a swimming pool. In addition to providing shade, the awning-like structure is meant to visually accentuate the width of the site. 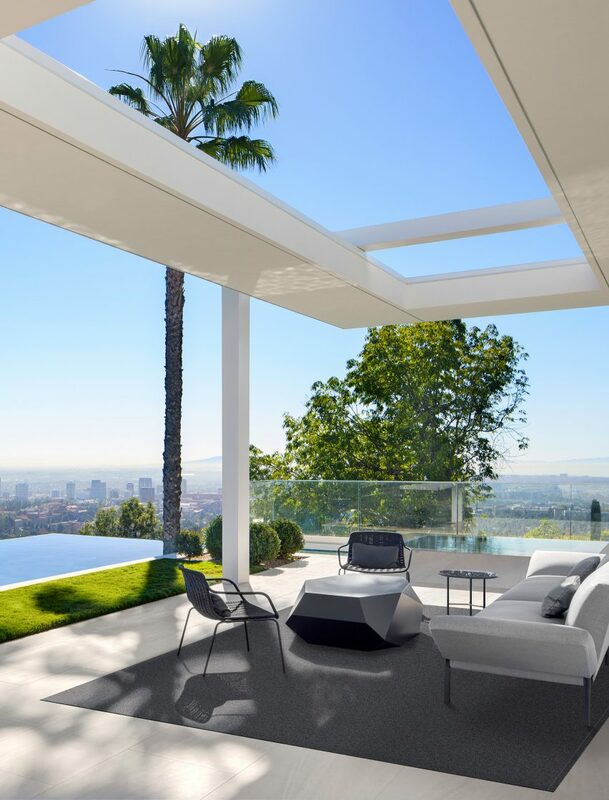 “This iconic canopy – its skinny, expressed structure reminiscent of Koenig’s Stahl House – floats effortlessly over the east terrace as it draws a deliberate frame around the quintessential blue sky and palm trees,” the studio said. Landscaping plays an important role in the design. Several existing trees, such as two palm trees near the pool, were retained. The team added a range of additional plants that are meant to contrast with the building’s modern forms and materials. “It was impossible to introduce a courtyard into the heart of the plan, and so the planted spaces were critical, softening the look and feel of the contemporary forms and allowing a more intimate experience of the leafy site,” the firm said. Founded in 1987, SAOTA is known for creating upscale, modern homes that engage with the outdoors. 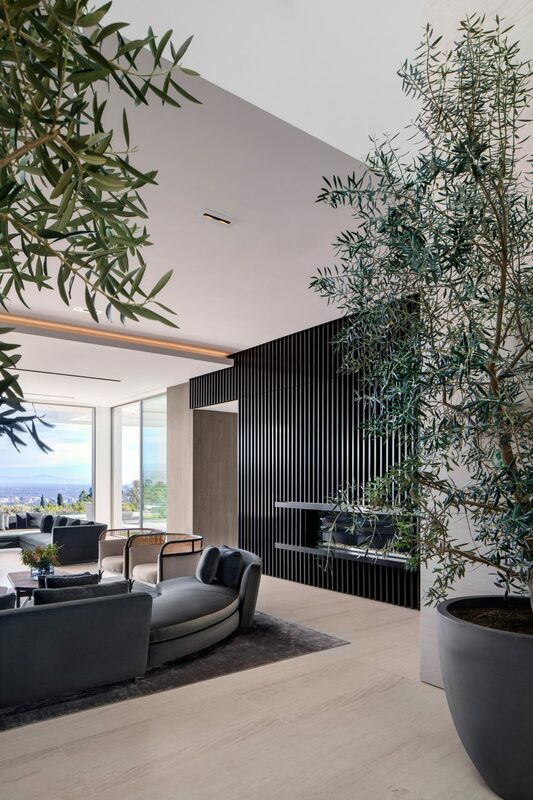 Other projects by the firm include a mountainside villa that frames views of Cape Town’s dramatic scenery, and an expansive Miami residence that features a basketball court and a waterslide. Photography is by Adam Letch.